Rev. Dr. Joan Brown Campbell is chair of the Board of Trustees and the Global Compassion Council. She is an ordained minister with standing in two Christian denominations, the Christian Church (Disciples of Christ) and the American Baptist Church. She was ordained at age 50 and has given national and international leadership to both ecumenical and interfaith work. Dr. Campbell is truly a woman of "firsts." She was the first woman to be Associate Executive Director of the Greater Cleveland Council of Churches; the first woman to be Executive Director of the U.S. office of the World Council of Churches; the first ordained woman to be General Secretary of the National Council of the Churches of Christ in the USA; and the first woman Director of Religion at the historic Chautauqua Institution, a center for religion, education, the arts, and recreation. Rev. Campbell is a devoted activist for peace and social justice, believing that citizens in a democracy must act on their conscience. This commitment was crafted during her life changing work with Dr. Martin Luther King Jr., and was deepened in the struggle to end apartheid in South Africa. She served as an honorary election monitor with President Kaunda of Zambia in the election of Nelson Mandela as the first African president of South Africa. Archbishop Desmond Tutu referred to her as “a woman of courage and compassion" and pointing out that Rev. Campbell was the only woman in the clergy procession of over 200 for his enthronement as Archbishop of South Africa. During her tenure with the National Council of Churches and the World Council of Churches, Rev. Campbell participated in some of the greatest historic events of the last century. She led a delegation to present the Catholic edition of the New Revised Standard Version of the Bible to Pope John Paul II. She was the co-director with Rev. Jesse Jackson of the mission to Belgrade where, with the help of the Serbian Orthodox church, they successfully negotiated the release of American soldiers held captive. Dr. Campbell traveled with President Clinton to the funeral of Rabin in Israel, and has led peace missions to the Middle East including meetings with the major leaders in the region. Rev. Campbell negotiated between Fidel Castro and President Clinton the ultimate return of Elian Gonzales to his father in Cuba. Rev. Campbell, working in concert with Paul Gorman, Carl Sagan, Dean James Morton, and Albert Gore, founded what is today the National Religious Partnership for the Environment, and continues as Chair of the Board. Rev. Campbell’s commitment to growing the global compassion movement is reflected in her work with Charter for Compassion International, currently serving as Chair of the Global Compassion Council. She is Co-Chair of the Global Peace Initiative of Women, providing leadership to GPIW's important work with women throughout the world, and was the former Chair of the Global Health Council. She is the recipient of 14 honorary degrees, including one from the University in Monrovia, Liberia sponsored by the African Methodist Episcopal Church. In 2010 she was awarded the Walter Cronkite Faith and Freedom Award. Rev. Campbell is the author of Living Into Hope: A Call to Spiritual Action for Such a Time as This, and Prayers From Chautauqua, a collection published in 2013. She is the mother of three grown children and grandmother to eight. Photo: published in CubaSi. Taken in conjunction with Rev. 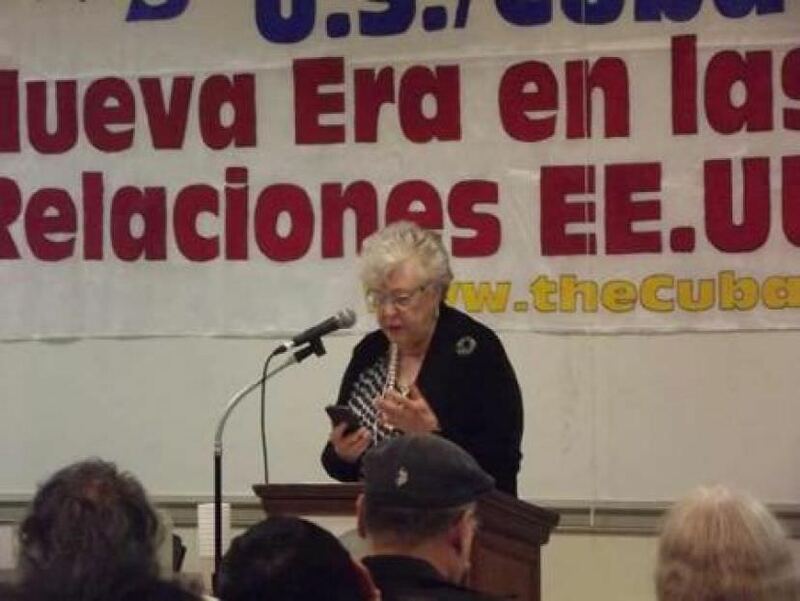 Dr. Joan Brown Campbell's visit to Cuba.